Kyocera are launching their all-new color A3 25ppm MFP: the TASKalfa 2550ci. With this new machine, Kyocera are puttin themselves up against the Canon iR Advance C2025i, the Ricoh MPC2551 and the Xerox WC7125. Compared to its predecessor (TASKalfa 250ci), the TASKalfa 2550ci has less capacity in the feeder (50 sheets instead of 100) and there are fewer finishing options (hanging stapling unit, no booklets). Maximum paper weights are up, however, and some hardware features have been upgraded (e.g., hard disk of 160 GB). Lastly, its paper capacity is half that of the 250ci. 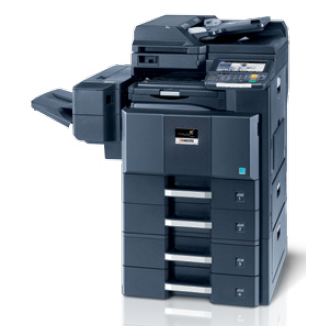 All together, this new 25ppm MFP is an entry-level A3 machine designed to compete in this difficult territory.